Since I’ve been at this for a whopping two months now, I am fully qualified to pass along The Wisdom of the Ages in terms of quilting. These are mostly things I have learned or am learning The Hard Way. Some of it has been imparted to me by Barbara, Mike’s mom Sharon and various bloggers. 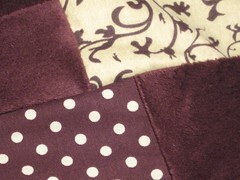 * If your sewing machine suddenly gets quieter, it is up to something. In my case, it’s usually run out of bobbin thread at the least opportune moment possible. Likewise, if your machine suddenly gets louder, this is also probably Not Good. Any change in pitch could be construed as shenanigans. * Pay attention to what sort of thread you’re buying. I recently got excited about a box of Gutterman thread on sale for $20. I am now the displeased owner of 20 wonderfully colored spools of 100% polyester thread I will likely never use. I didn’t notice this, however, until long after the fact. I leave it on the rack because it looks pretty, and I try to remember not to use it after The Iron Incident. * Face the hot plate of your iron away from places you might put your arms, hands or face. Also, the edges of your iron’s hot plate are just as burny as the face itself. 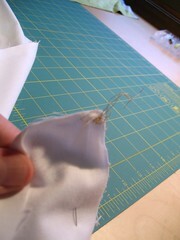 Catching up loose threads makes your sewing machine unhappy – see previous note regarding changes of pitch. * Some days you get the bear; some days, the bear gets you. In the immortal words of a great poet, “know when to fold ’em.” Hey, I grew up in the 70’s, and Kenny Rogers made me cry on multiple occasions with his poignance. * There is a religious war over whether to pre-wash fabrics or not. Here’s my two cents – it surely is convenient not to pre-wash; there’s no ironing, no clipping of the damnable threads… the fabric is there, ready to use. However, many companies spray their fabrics with formaldehyde and other toxins to keep bugs from eating it and as a preservative. My eyes and throat burns when I iron some unwashed fabrics, and I’m not wild about that. I pre-wash anything that is fat-quarter-sized or larger, and don’t with charms and rolls. Also, many cottons will shrink upon washing, and pre-washing helps mitigate that effect. 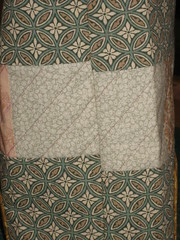 Some people do like the antiqued look of a not-preshrunk quilt, though. I see both sides of this particular argument, and am hard-pressed to come down on one side or the other, but for me, I’m going with Not Cancer. * Make peace with your seam ripper. It’s not the enemy – it’s your friend, the one who corrects your mistakes and oversights. Last night, after I’d sewn one side of the border on upside-down, I’d just spent 30 minutes or so pinning and sewing that sucker. I didn’t want to rip it out! Today, with some passed time, ripping it and redoing it wasn’t such a big deal. 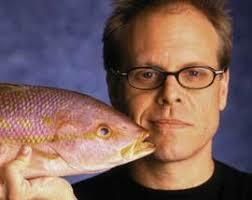 * I recently saw Alton Brown speak, and he answered questions from the audience. “Have you ever made a dish that you just couldn’t get right?” He thought for a moment and said, “no, everything I make turns out.” You are not Alton Brown (if you are, my apologies and also, omg hi.) You are not infallible. You’re not going to get everything right on the first time. Be kind to yourself. I am still working on this one. * Make do with what you have. If you have a well-lit quilting studio, then I am envious and more power to you. However, if you are stuck in a basement corner, or wedged into a large closet, that doesn’t mean you can’t do truly spectacular things. 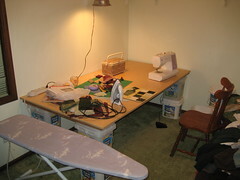 My sewing table is a large piece of finished plywood held up by cat litter boxes – it works just fine. If you have design wall, great! If not – you surely have a floor. * Read blogs and websites if you find yourself lacking in motivation or inspiration. There are some truly amazing people out there, and their work may just get you going. Few quilters are islands. * If you find yourself doing poorly with cutting or sewing in straight lines or you’ve just sewed the fabrics wrong side out… walk away. Do something different, even if that something different is hand-sewing or reading project books, or something else related but not identical. * This may just be me, but – watch television or sew. Don’t do both and expect to a.) understand the plot of the show fully, or b.) have a flaw-free product. * Don’t try to catch bamboo stilettos in your lap. * Sleep now and then. * Keep beverages off the sewing table. Likewise, pizza boxes. * Ironing boards are unstable creatures. 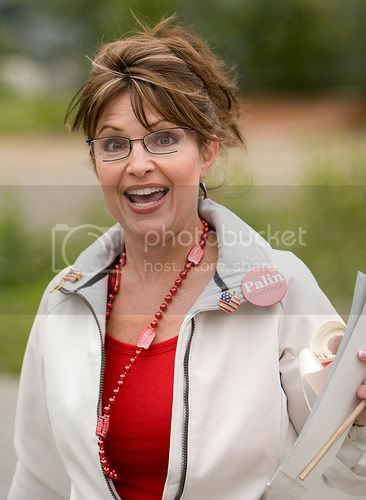 It is their nature, much like pregnant alpacas and Sarah Palin. * Keep your machine oiled frequently. Corollary: Don’t oil your machine with your quilt right there next to you. * If your sewing area has a ceiling fan, be wary of standing up on your chair to get a better photograph of something on y0ur table. * Some scraps really are too small to warrant keeping. * Mind your posture. Long hours hunched over your machine can do Very Bad Things to your body. * Mind your posture. Short periods bent over at odd angles to pin and/or cut can do Very Bad Things to your body. * Remember your dogs, cats, plants, significant other(s) and various real people in your life still exist. Appreciate the time they let you do something you love. * Measure, measure, measure. If your fabric doesn’t have a straight pattern, it doesn’t matter if it’s straight in relation to the rest of the world. Make a straight edge and use that – don’t worry about the grids on your mat. * Polyester microfleece was sent straight from hell to taunt us with its touchable softness, which is only rivaled by its inability to hold still. * Make sure you have decent light. Pay attention to whether you need to wear your glasses (if applicable) or not. I’ve found my eyes strain more with mine on. * To see if you have enough contrast in your blocks, squint at them. * If you make rice bags, mind your dogs don’t eat them. * Keep the blade in your rotary cutter sharp – the dullness creeps nefariously in until you find yourself cursing that it’s missed another half-inch strip as you were cutting your last line. * Unless you’re in a contest, no one will ever be as critical of your work as you are. They won’t see all the flaws, and the ones they do see won’t be judged harshly. See previous note about kindness to self. 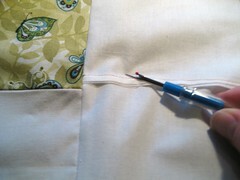 * Vacuum your sewing room every so often, lest trails of thread and scraps be strewn about your house. Here, it’s not as noticeable with all the black dog hair on the white carpeting. * Admire your work from time to time. Step back away from it, take it all in. * Cotton doesn’t melt – unless it’s polyester you only thought was cotton – don’t be afraid of your iron’s Nuclear Strike setting. * Food items left in the oven do not care if you didn’t hear the timer go off because you were engrossed in your project. Corollary: Look into obtaining a sous vide machine, which will never, ever burn or overcook your food. * Throwing fabric against the wall seldom results in a satisfying thud. 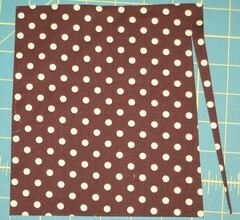 * Throwing the sewing machine is not advised, although the resulting thud would assuredly be quite satisfying. As an aside, I searched Google for “broken sewing machine,” “destroyed sewing machine,” and “damaged” and “obliterated sewing machine” and came up with absolutely zero appropriate images. That was disappointing. * Stay hydrated. Pee now and then. If you repeatedly say, “ok, I’ll go get something to drink after just one more block,” you will eventually shrivel. * I am in even less of a position to offer budgetary advice – however, the common wisdom is, “find out what your sewing budget is, and stick to it, regardless of what you just found on clearance and can’t live without.” Corollary: Your car insurance company will not care about Anna Maria Horner. * You’re creating hand-made stuff. It’s not rocket science or brain surgery or the ICU. It’s an honorable, noble thing you’re doing. It’s time-honored and fun. Get out of your own way. That’s about what I’ve got thus far. What wisdom have you accumulated? What do you know now you wished you’d known all along? What blatantly obvious thing have I missed here? I would love to hear your thoughts. Great advice. Unfortunately I have also learned some of those lessons the hard way. Oh my, what a much needed laugh I got from this today! Love it!